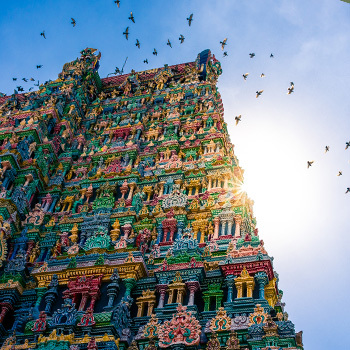 Pradosham is an auspicious 3-hour period, 1.5 hours before and after the sunset, and is celebrated bi-monthly on the 13th day of every fortnight. ‘Pradosham’ literally means ‘removal of sins’ and hence, this time window grants the opportunity to remove your karma or karmic energies that limit your potential in your current life. 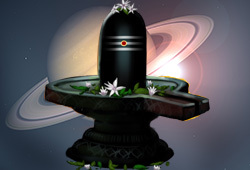 The time between 4.30 PM and 6.00 PM is observed as Pradosham. The smaller energy level Pradosham occurs every day during this time window. Middle energy level Pradosham occurs twice a month on the 13th day after a New Moon and a Full Moon. Larger energy level Pradosham occurs when one of the 13th moon days falls on a Saturday. Tuesday Pradosham: Thanks for sharing the info via email which has helped me to enlist in certain rituals to relieve of my debt burden and many thanks for the prasadam which has arrived in a timely manner as mentioned in the service. Many thanks for the great work to enhance others’ lives!!! Sani Pradosham: I was satisfied with the service. Please use paper bags instead of plastic bags for Vibuthi, Kum-kum etc. The effects of this ceremony were very effective. I felt the energy even though was not able to watch it live. It really did dig obstacles from my body mind system and helped me very much. So thank you AstroVed very much. I simply felt a sense of peace and protection, which is invaluable. 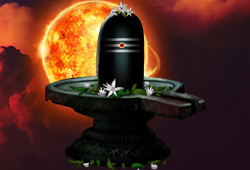 Dr. Pillai recommends two powerful energy vortexes of Lord Shiva to perform Pradosham rituals on every Pradosham (13th lunar day) and get relief from the karmic burden in your life. A powerful karma-removal vortex, identified by Dr. Pillai, which has the energy to remove karma very fast. This is a special vortex where Lord Shiva appeared as a golden lizard and the Powerspot tower holds statues depicting that story. 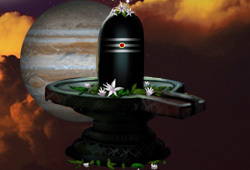 The image of the Shiva Lingam is peculiar at this Powerspot. Rather than rounded at the top, it is pointed upward like a lizard tail or a sword blade. This special Powerspot at Chennai, Tamil Nadu is the first Powerspot, where Pradosham rituals are believed to have begun. 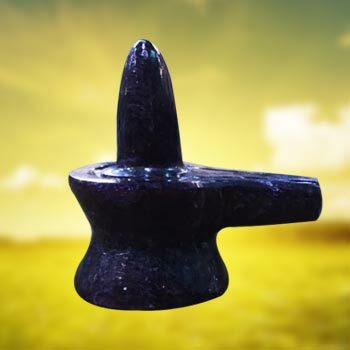 The Shiva Lingam at this Powerspot is very small, similar to an inverted earthen lamp. 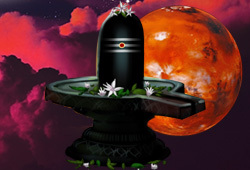 According to mythology, Lava and Kucha, the two sons of Rama made this Lingam to seek relief from the curse of fighting against their father Rama. 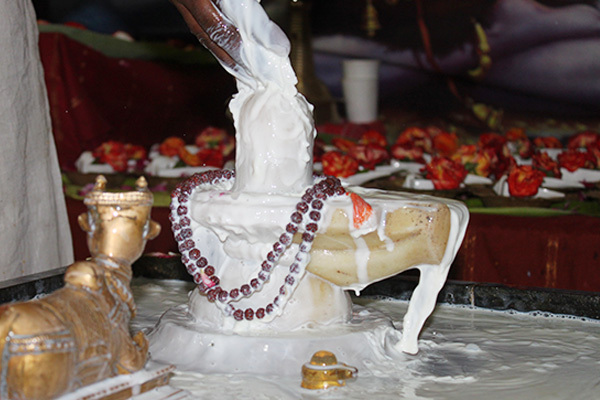 According to legend, the Devas (celestial beings) and the Asuras (Demons) churned the cosmic ocean of milk for Amirtham (nectar) using Mount Meru as the stick and Vasuki snake as the rope. Upon severe movement in opposite directions, the divine snake suffered extreme abrasions and spat out “Halahala” venom into the nectar. The Devas were afraid to go near it and cried out for help to Lord Shiva. 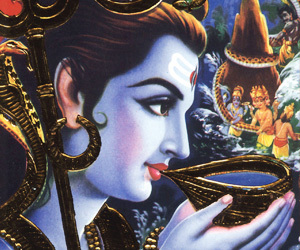 Shiva, the ultimate preserver of the universe, pleased with their prayers drank the venom to save them. Goddess Parvati, his consort was afraid that it might kill Lord Shiva and held his throat to prevent the venom from going down to his stomach. 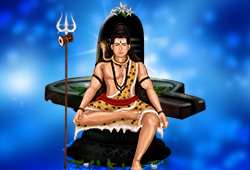 The venom turned his throat blue and since then, Shiva is also being called as “Neelakanta”. 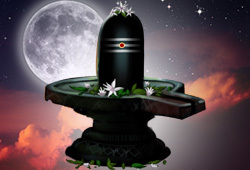 On a Trayodashi (13th Moon phase), the Devas realized their sin and pleaded Lord Shiva for forgiveness. This delighted him and the Divine Almighty danced with joy in between the horns of Nandi, his mount. 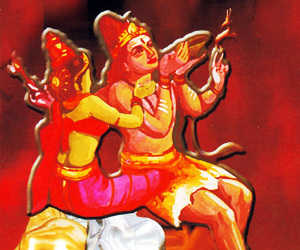 It is believed that he performed this dance during the Pradosham time and that he does it every day. 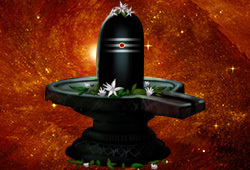 Hence, during Pradosham, Nandi is also worshipped in all the Shiva Powerspots across South India.